We drive from Leh in the morning towards Lamayuru (3 hrs) along the Indus River through Sham valley. Lamayuru monastery was founded by Rinche Zangpo in the 10th century. This gompa is located amidst the massive mountains. The spectacular setting of this gompa and its renowned collection of carpets, thangkas and frescoes has been attracting many people over a long time. It is believed to be the oldest in central Ladakh. After visiting the Lamayuru Monastery, we pack our backpacks, watch the horses get ready and set off for our first day trek. 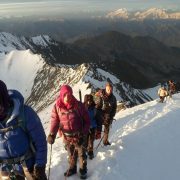 After following the stream for sometime, we will gradually move up to the small Pass of Prinkti La (3750m). We will the walk down a narrow gorge to the small village of Shilla, and the last 3 km will take us to Wanla (3250m). Following a dusty road we will reach the small village of Phenjilla (3410 m) and the scattered village of Uri . We will then walk through a narrow gorge until we reach a traditional Rangthak (flour mill) at the far end of the village. 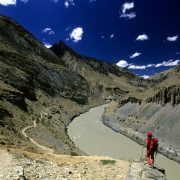 The trail will then cut through the village of Hinju (3720 m) roughly 2 km below our campsite in a yak herder encampment. From the encampment we will continue along the trail and ascend the ridge below Kongskil La (4950m). If lucky we will get glimpses of some wild life. 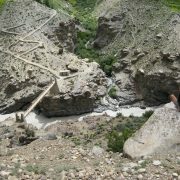 We will then climb gradually until we reach Kongskil La where we will be surrounded by dizzying views of the Karakoram and Stok ranges. The descent down the trail is quite steep with loose moraine causing the difficulty to be careful! The trail then follows the left side of valley floor, passing a yak herders hut (4500m), before we reach our campsite. This valley is occupied mainly by the villagers of Sumda Chenmo. After a short walk and a few river crossings, we will reach the village of Sumda Chenmo. From there we head towards the true left side of the valley, which provides a beautiful view of the village with its lush greenery. Further on the trail cuts through the valley wild rose bushes and leads us to another river crossing (this stream originates from the high snow- capped peaks of Photoksar (5685m). Before making a steep challenging ascent over Lanak, we will see Edelweiss and some of the other rare wild flowers of Ladakh. From the campsite, there is a splendid view of Konskila. 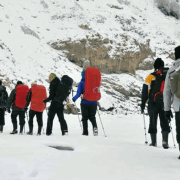 We will begin the day with a straightforward climb to Dungdung Chan La (4820m), which offers views of the beautiful vistas of the Stok Range in the east and the Zanskar Range in the south. From the pass the trail gradually descends down a ridge toward the valley continually tapering before reaching the village of Chilling. Chilling is the only village in Ladakh that has provided metalworks such as copper, bronze, tin, silver and iron to the Leh market through the centuries. From Chilling we will drive for about 3 hours along the Zanskar River . We will eventually reach its confluence with the Indus and the easy road back to Leh. This day almost 2 hours to reach leh by car via Zanskar river and Indus river. 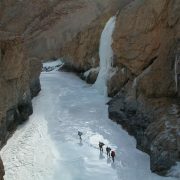 In other hand, this day if you like to raft on the river of Zanskar that is most wonderful part of the rafting point.